On a Thursday evening your doorbell rings. You open the door to find a 9 year-old child on your threshold who says, “Hi. I’m selling candy bars for my school. Do you want to buy one?” Would you buy one? Or would you politely decline? What if the child instead said to you, “Hello. Do you think children should be reading more?” If you respond affirmatively, they follow up with, “Do you mind buying a candy bar to support our library?” Chances are that you are much more likely to buy that candy bar after agreeing with the child that children should read because you now feel compelled to back up your previous affirmative statement. That scenario is more than a clever sales pitch for a child — it is a perfect example of the social contract compelling you to act. Social Contract. One approach you can take with a suspected fraudster is to create an environment that fosters "cognitive dissonance. Hood explained that if you force someone into a situation where they use cognitive dissidence to lie to themselves, they are more easily exposed. Hood said, “Generally we do not want to lie. It goes against our nature.” He said that if you lie to a stranger, you won’t have as much trouble changing your story later, or denying what you said previously. However, if you lie to someone you know, or if you write down the lie, you’re more likely to stick to that story, no matter how outlandish it might be. No one wants to admit they are a liar, but the stakes are even higher when their lie is in writing. Anti-fraud professionals can potentially trap a fraudster by exploiting that. Reciprocity. Humans are naturally inclined to reciprocate what they perceive to be kind gestures from others. Hood suggested some seemingly minor tricks to use in an in-person interview with a suspect — like offering them a can of soda or a more comfortable chair. The same concept can even be applied to interviews over the phone. Starting a thought with an implication of camaraderie or collusion — like saying, “I normally don’t share this with people, but…” — can make the target of the interview feel that they must give you a piece of information equally special. Priming. The context and tone of words that anti-fraud professionals use in interviews of potential fraudsters can completely change the responses they get. Simply softening an interrogation about embezzling to a line of questions about “misplaced” money can elicit more honest responses from suspects, or even unwitting pawns. When people feel like they are safe and understood, they’re more likely to share information. Priming your words to make them feel understood is an easy way to achieve that truth. 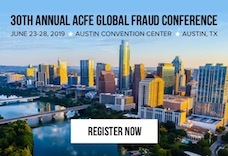 There are many ways that anti-fraud professionals can build a case against fraudsters, but much of the work that requests for documents, subpoenas and audits do can also be accomplished by tapping into the most basic aspects of the human psyche.